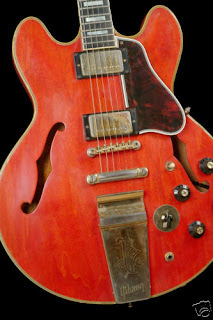 The Guitar Column: Gibson ES355 Owned By Freddie King On eBay! The Gibson ES355 also came with a 'Stereo' feature with discrete outputs from each pickup that could be sent to two separate amplifiers. Freddie kept his pickup selector switch in the middle position --both pickups 'on' -- and played through a Fender Quad Reverb amp. 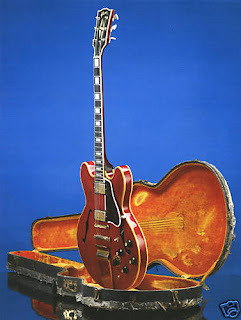 The ES355 was Freddie King's main axe of choice for most of his career, although he did on occasion also play ES335s, ES345s and Les Pauls. This particular ES355, serial number 580445, dates from 1967. According to the seller, Freddie had its Vibrola trem removed and replaced with a stop bar tailpiece. When did you last re-apply to eBay Partners program? Keep trying!!! Yeah I should keep buggin' them.. thanks for reminding me JP!